Where teachers encourage their students to let their own unique vision shine in their artwork. 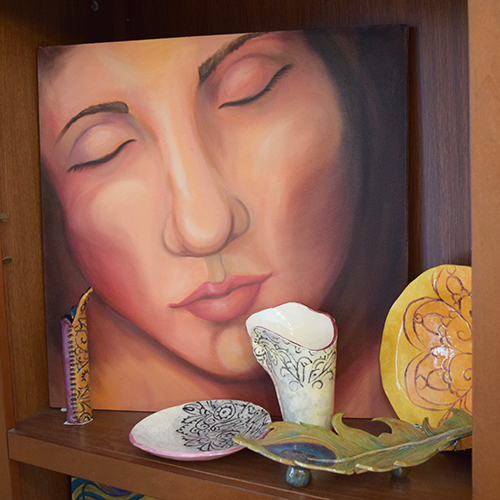 Tucked back off the busy Skippack Pike at the intersection of Store Road and Mensch Road, you’ll find this quaint art studio. 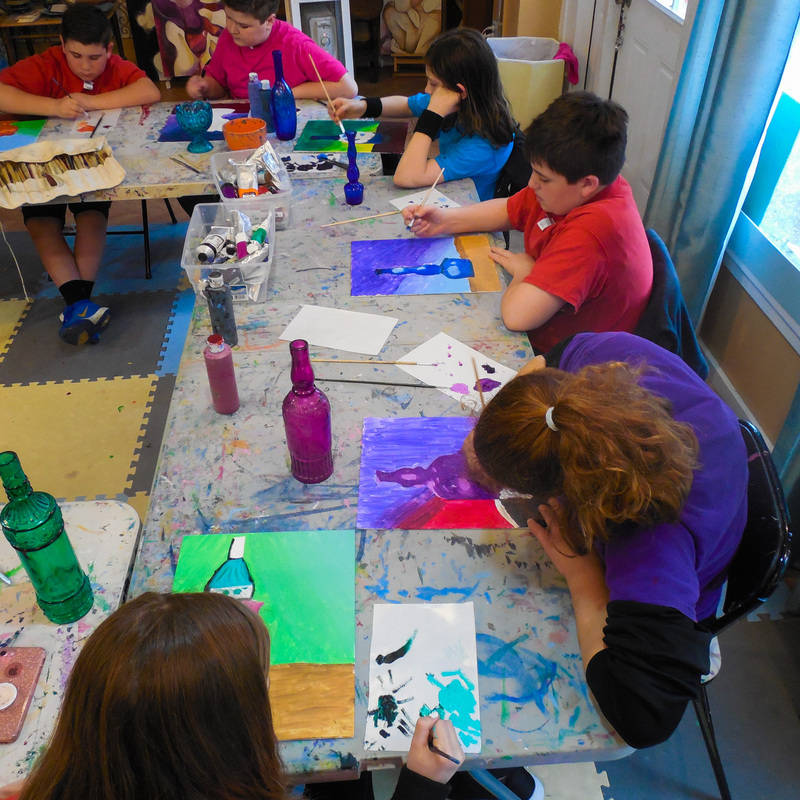 Engage Art Studio offers classes for all ages in a variety of areas throughout the year! Their programs include summer camp and school year classes for kids, as well as classes for adults. Every staff member at the studio is an artist and brings true passion to their work here, starting with the owner, Melissa Thurman. She has been an artist since she was a child and enjoyed drawing and painting her whole life, then attended Tyler School of Art and majored in printmaking. 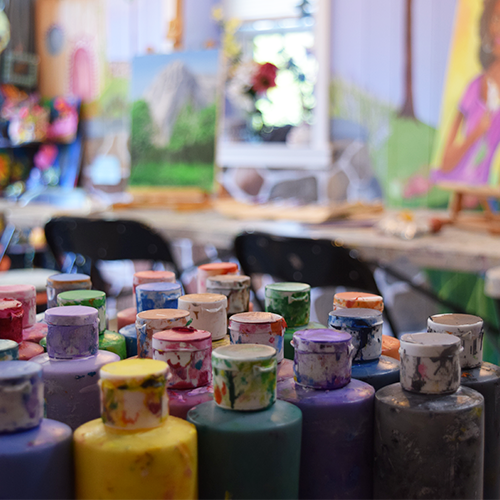 In addition to running classes at Engage Art Studio, Melissa and the studio also do custom artwork including murals, mosaics, furniture painting, and just about anything a client can dream up. Recently, Melissa has been doing a lot of ceramic work in her spare time, as well as experimenting with a wide variety other mediums. During our interview, she showed me intricate lace prints made of hot glue drawn on cardboard, which were to be pressed into ceramic creations like vases and plates. Melissa has transferred her sense of creativity into Engage Art Studio, where there are no rules when it comes to creating your own piece of art! So, when did Melissa decide she wanted to open her own art studio you ask? Well, while working at an art studio during college, Melissa absolutely fell in love with teaching. Teaching is certainly not a skill that every person is gifted with, but she has been teaching for more than 10 years now! Melissa discovered Skippack Village by driving through town during her commute while teaching at other locations, and after years of dreaming about it, she decided to jump in and open up her own studio. Engage Art Studio has been open for almost 5 years now, they will be celebrating their anniversary in the village in October. Be on the lookout for a big open house party some time that month! Although they teach fine art drawing, painting and ceramics, there is also a lot of experimentation with materials in the studio. The teachers are all practicing artists, who are wonderful at helping students bring their personal vision to life. Their kids’ classes are what the studio is famous for! 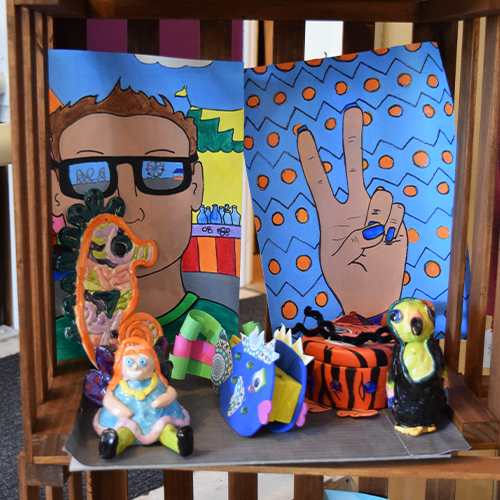 These offer a blend of fine art fundamentals in drawing, painting, ceramics, and sculpture, but these teachers also infuse unique experimentation with materials into their lessons. Their camp program runs all summer, and they also offer no commitment art classes in the evenings and weekends through out the summer. These teachers strive to make the space a home away from home for kids and artists of all ages, often sparking up creative conversation with questions like “what is the best super power to have?” They have become friends with the children that regularly attend classes and love to watch the kids grow as artists and people. New this summer, Engage Art Studio is offering a guest artist workshop series to learn specialty techniques and mediums. There is a Creative Still Life workshop on July 22nd & 29th, and a Fluid Ink Painting workshop on August 5th & 12th. It is a goal of theirs to expand the guest artist workshop over the next year. The studio would also like to begin to exhibit local artists in their gallery space with intentions of giving local talent a place to show off, as well as inspiring new artists. For more information or to sign up for classes, check out their Facebook or website!